The popular Ford Edge received some major upgrades last year. This includes new amenities, technologies, engines and a new look. All these and more garnered high praise from both reviewers and shoppers alike. Don't think the automaker is resting on its laurels. The Intelligent Access system, which locks and unlocks the sedan, is now standard on all 2016 models and trim levels. Same with push-button start. The equipment lists of the 2016 Edge were reshuffled with advance tech features like the foot-activated hands-free power liftgate now available at the lower trims. The most significant change made to the 2016 Edge is the incorporation of SYNC 3. This latest version of Ford's advance telematics and infotainment system brings a new easy-to-read 20-centimeter colour LCD screen for driver and front passenger alike. Voice recognition has been enhanced as well. Finally the iphone's popular Siri virtual assistant can now be readily accessed via the Siri Eyes Free feature. SYNC 3 comes standard on Titanium and Sport trims and is offered on the SEL. The three engines available to power the Edge underwent some slight tweaking. For 2016, base SE models with front-wheel drive (FWD) get the 2.0-litre four-cylinder turbo with auto stop-start capability. This feature shuts down the engine when the vehicle is stopped, then restarts it when the driver releases the brake pedal. Such equipped Edges now have a rating of 11.3 L/100 km in city driving. SE models with all-wheel drive (AWD), the mid-level SEL and the premium Titanium all come equipped with the standard 2.0-litre turbo. Horsepower and torque, which are rated at 245 and 275 respectively, are not affected with either engine. Besides the 2.0-litre four, the Edge Titanium can be had with a 3.5-litre V-6 good for 280 horsepower and 250 lb.-ft. of torque. Fuel consumption is still quite good at 13.4 L/100 km in city driving and 9.0 L/100 km on the highway with FWD models, and 13.7 L/100 city and 9.6 L/100 km highway when equipped with AWD. 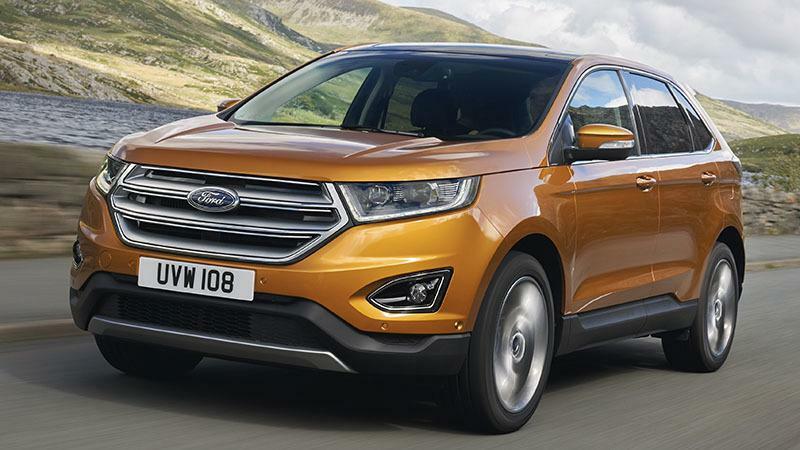 "The [Ford Edge] brakes are powerful and progressive and the ride quality worth of praise, more car than truck in terms of feel and handling," notes a reviewer from the Chronicle Herald. "The stiffer platform and new rear suspension obviously come into play here. It is also a very quiet place to spend some time thanks to thick, acoustic damping glass in the windshield and side windows, copious amounts sound deadening and effective seals throughout." The Edge Sport continues to be powered by its exclusive 315 horsepower 2.7-liter V-6 turbo. Contact Us to Test Drive the Ford Edge!